[?] Do you believe in God? Einstein - “I’m not an atheist. I don’t think I can call myself a pantheist. The problem involved is too vast for our limited minds. We are in the position of a little child entering a huge library filled with books in many languages. The child knows someone must have written those books. It does not know how. It does not understand the languages in which they are written. The child dimly suspects a mysterious order in the arrangement of the books but doesn’t know what it is. [?] Is this a Jewish concept of God? [?] Is this Spinoza’s God? [?] To what extent are you influenced by Christianity? [?] You accept the historical existence of Jesus? [?] Do you believe in immortality?
. : Quoted from a remarkable interview that Einstein gave shortly after his fiftieth birthday, in which he was more revealing than he had ever been about his religious sensibility. George Sylvester Viereck was the person who took the interview.
. credit Einstein and the Mind of God via On Faith, Washington Post / posted by Walter Isaacson, the CEO of the Aspen Institute, has been chairman of CNN and the managing editor of Time magazine. 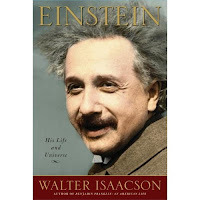 His new book, "Einstein: His Life and Universe," was published last month.
. [>] also a good read An Ideal of Service to Our Fellow Man by Albert Einstein via NPR.